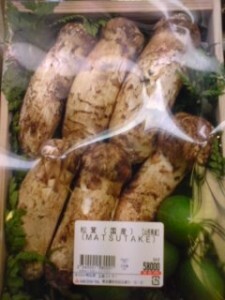 TsukuBlog | Enjoy Japan`s Aromatic Autumn Delicacy- MATSUTAKE MUSHROOMS (松茸)- you dont always have to pay through the nose for them! Growing up in the US way back in the 20th century, I only knew them as rubbery little brown slices that came out of a can. Coming to Japan opened my eyes to the exciting and varied world of mushrooms, or ki no ko (literally the children of trees) in Japanese. A walk around the produce section of your local supermarket in this season will reveal an exciting array of edible fungi, which when cooked are startlingly tasty (try stir frying maitake mushrooms in soy sauce and sake!). According to a popular traditional Japanese expression, SHIMEJI mushrooms are the most delicious (though many now prefer maitake and shiitake). The same adage 香り松茸味しめじ (KAORI MATSUTAKE AJI SHIMEJI), however, claims that in terms of aroma the matsutake mushroom is king (the expression directly translated means “aroma matsutake, taste shimeji”). The matsutake has become one of the three representative foods of the season (along with persimmons and sanma (a kind of fish), and valued as a delicacy and as a high end gift. 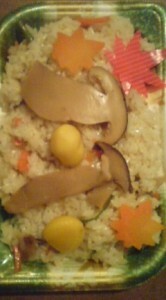 Many Japanese like to have steamed matsutake rice, with its unique aroma, at least once every autumn. Tsukubans interested in having a classic autumn culinary experience, can do so, with an inexpensive matsutake rice lunch set, at the ICHINOYA RESTAURANT. For the price of a usual lunch set (teishoku) you can have a MORE THAN FILLING meal which includes the famous delicacy (the matsutake they use are not domestically harvested). This special menu will only be available till the end of the month so you had better hurry. If you do go, write me and tell me how YOU would describe the aroma. 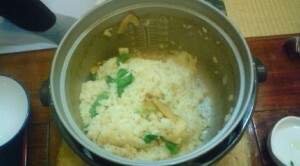 I have asked several Japanese (including professional chefs) what word they would use for the smell. The usual response was ”HHMMM, well, uh, it’s the MATUTAKE AROMA!” As for me, the aroma and flavor are something I would put into words as earthy-citrusy( I guess the citrusy taste is not from the mushoom itself by from the SUDACHI, the citrus fruit which is often added to the matsutake broth- DOBINMUSHI). 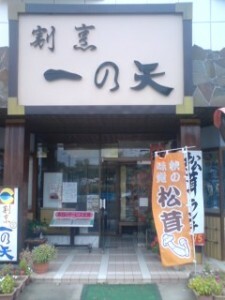 Ichinoya restaurant has been around for a long time and is a favorite place for older Ibarakians. They serve up most kinds of Japanese food in very generous portions. It is also very reasonably priced ( the matsutake rice set with out meat is about 1500 Yen- including DOBIN-MUSHI broth and matsutake rice, among other things). Last night I was at Kaneki-Zushi, an upscale roundabout sushi chain, and when I asked what soups they had, the waitress said they had had matsutake broth, and added- buts its a little expensive. When I asked how much, she responded with a price that I dont exactly remember, but it was something in the 700 Yen range. 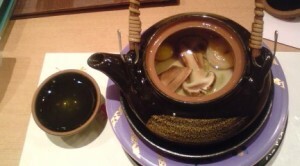 I decided to go for it, and was not disappointed- some matsutake, a shrimp, and a gingko nut , all boiled in a special broth were served in a tea pot with a slice of SUDACHI ( a citrus fruit which looks like a lime) on the side. I poured the fragrant soup into the little cup I was given and slowly savored the subtle flavors. 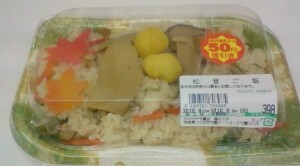 I also found some very cheap matsutake rice lunch boxes at the Yamauchi Supermarket in Takezono. Only 398 Yen- and to my taste- not bad at all ( though I am sure connoisseurs would strongly disagree!). perfect for getting into the spirit of the season! A closer look at the lunch box- with autumn leaf shaped carrots, and sweet chestnuts- a perfect seasonal treat! Though I would never actually buy them, with all the cheap imports available, it is still always fun to go to a fancy supermarket and look at the price tags on the prime specimens of domestically grown matutake. 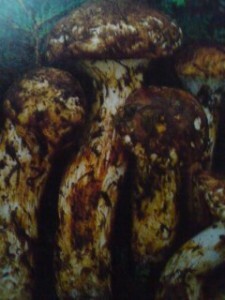 A box of six matutake mushrooms going for 58,000 Yen ( more than 600 dollars) a box at a Tokyo supermarket! 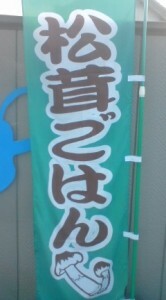 My haiku “Matsutake-ya Ah-Matsutake-ya Matsutake-ya”; somehow resembling “Matsushima-ya Ah-Matsushima-ya Matsushima-ya”, parody haiku of Matsuo Basyou(poem about beautiful islands in Miyagi-prefecture). In every autumn I would remind bucketfuls of king-sized　Matsutakes those I have picked three continuous years when I was working in National forest in Hiroshima prefecture to build an experimental beef cattle-raising farm 40years ago. 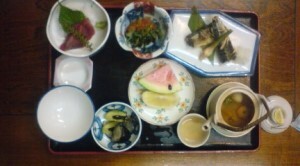 “Night and day” I tasted grilled Matstutakes, boiled one, soup, sukiyaki, even gusto-ed pickled one in new year. So now I always think when I see their high-price, Um I already ate plenty enough Matsutakes for my life time, “let it be” to leave them for coming generation, regretfully. Thank you Avi-san you made me to secrete saliva. I love that aroma and crunchy texture too! If you put Matsutakeol(synthetic odor) to Eringi, even the connoisseurs can’t tell!